Enjoy a Re- Spin of the slot reels & a Nudge Feature for multiple wins in this NetEnt powered slot game Temple of Nudges! Temple of Nudges is a video slot game with 5 reels and 3 rows. It has a total of 243 bet ways. Powered by NetEnt, this online slot game is another great addition to this software manufacture’s online list of slots. The graphics and looks of the game are highly appealing with the scene of a Jungle expedition taking place in an ancient Mesoamerican themed temple. There is a Nudge Feature and a Re- spin Feature that will make things quiet interesting as you find yourself moving deeper and deeper in to the confines of the ornamented slot reels. As main symbols, there are Cougars and Monkeys and Anteaters along with many other creatures of the jungle in the mix that are carved in stone. There are birds, temples and snakes acting as low pay out symbols as well. A casino player can choose to bet from a mere £0.25 or 25p to a decent £250 per spin. With a medium to high variance, this slot game has an RTP of 96.03% and can lead to a big win in coins, in case you’re lucky. Read this accredited review to know about the bonus features and free spins along with any game rounds hidden in the shadows of the game. You can even login in to a casino of your choice and choose to play the demo version to play for free. How to Play the Temple of Nudges Video Slot Game ? Visit any of your favourite ‘NetEnt Online Casino’ and open ‘Temple of Nudges Slot Game’. A player can choose to ‘Play for Real Money’ at the casino or ‘Play for Fun’ in the free demo version. Once there, a player will see a deep jungle screen with a Mesoamerican Aztec theme to it. A player can click on the ‘Spin’ icon to spin the reels of the slot game. A player can click on ‘Max Bet’ to play the slot game on the highest ‘Bet Level’ and the current ‘Coin Value’. There are 1 to 10 bet levels to choose from with a total of 25 coins per level in this casino game. The ‘Coins’ will display the total ‘No. of Coins’ that are available for a player to wager. A player can use the ‘AUTOPLAY’ or the ‘AUTO’ icon to play automatic spins for a selected number of rounds. A player can achieve a bet way win whenever matching symbols appear anywhere on the adjacent reels. Click on ‘i’ icon to take a look at the ‘Pay Table’. Click on ‘?’ to learn about any game rules and bonus features provided in the game. This is a 5 reels and 3 rows video slot with a ‘Nudge Feature’ and a ‘Re- Spin Feature’. Temple of Nudges Slot Game has a total of 243 bet ways to win from. There are no bet lines available in this video slot. The winning combinations as well as the pay outs are paid as per depicted in the ‘Pay Table’. The matching symbols in any position, on 3 or more reels that are adjacent to each other, is a bet way win. The pay table pays only for wins from the leftmost reel to the rightmost. Only the longest matching combination per symbol will be paid in this slots game. A bet way win in coins Is termed as the value depicted in the Pay Table multiplied by the current bet level. A bet way win in terms of currency will be equal to the win in coins further multiplied by the current coin value. Temple of Nudges Video Slot Game has a total of 243 Betways or Paylines for you to win with. Temple of Nudges is a slot game with 5 reels and 3 rows. It’s main theme is based on the Mesoamerican (Aztec or Mayan) Culture. The slot is situated deep in to the jungle with Anteaters, Monkeys and Cougars acting as standard reel symbols. For added effects, the background music is a crescendo of different tunes, that increases or decreases in volume as you play along in the game. If you manage to get a big win, the inanimate snakes carved at either side of the reels shower the slot screen with a multitude of gold coins, making everything much more fascinating. Thus, as far as the looks go, every animation, creature and tune in the game compliments the theme completely. So visit this mysterious Jungle, and set foot in to the ancient temple of the Aztecs, to find your treasure in this amazing Temple of Nudges Slot by Net Entertainment. Bet Level :It is represented by the ‘Level’ button on the slot panel. A player can choose to select from a total of 1 to 10 Bet Levels in this video slot game. Coins Per Level : There are ‘25 Coins per Level’ in this slot game. Coin Value : The ‘Coin Value’ range in this slot game is from 0.01 up to 1.00. Bet Value : The minimum ‘Bet Value’ allowed in this game is £0.25 per spin, with the maximum bet value allowed to be £250.00 per spin. AUTOPLAY :The ‘Auto Play’ button is right next to the ‘Spin’ button on the left side of the slot panel. It is used to spin the reels for a selected number of times at the current bet level and coin value. A player can choose to spin from 10 spins to a total of 1000 spins. Spin :The ‘Spin’ button is denoted by a Yellow button with two rotating arrows on it. You can click on it to play the reels on the current bet level and coin value. MAXBET : The ‘Max Bet’ button is located on the right side of the ‘Spin’ button. It will spin the reel at the highest bet level and the current coin value. Wild & Scatter Symbols : There are no Wild Symbols or Scatter Symbols available in Temple of Nudges Slot Game. However, there is a ‘Random Re-Spin Feature’ and a ‘Nudge Feature’ to make up for it all. Standard Reel Symbols : There are 8 Standard Reel Symbols in this video slot game. There are 4 high payout symbols represented by animal creatures namely a Cougar, an Anteater, a Sloth and a Monkey. There are 4 low pay out symbols as well. They are : The Sun, The Bird, The Snake and The Temple. Temple of Nudges Slot is a creation of the software provider - ‘Net Entertainment’ or simply ‘NetEnt’, as popularly known in the gambling world. Being the pioneer of some of the best casino slots games out there like ‘Starburst’, ‘Twin Spin Slot’, ‘Gonzo’s Quest’, ‘Vikings’ and many more, it comes as no surprise that this gem of a game is NetEnt’s innovation. This software manufacturer has been known in the market for its top- of- the- line graphics, mind- boggling animations and winning pay outs to be ranging from decent to really high for each of its game. They are trustworthy, compact and the games are simply fun to play on. All the casino games provided by NetEnt are available on multiple platforms, may it be your mobile phone i.e. your iPhone (iOS) or an Android Phone or if its your iPad (or any other Tablet) or a Desktop (or even a Laptop), it is compatible with all of them. All of its games are mobile friendly, thus, making it easy for you to play all you want even while travelling. In this feature of the slot game, each time a player manages to achieve a winning combination on the slot reel, the ‘Nudge Feature’ gets activated. Then, after a win count is up, the slot reel moves or nudges 1 symbol down per spin. Therefore, in case there is another winning combination, then, the win is counted again and the Nudge Feature stays active. This process keeps going so long as the wining combinations keep occurring, thus resulting in multiple pay outs. The Nudge Feature is played at the same coin value as well as bet level as the slot spin that activated it. All the Nudge wins will be added to the player’s account balance. When the ‘Re- Spin Feature’ is in play, then all the winning symbols will stick to the reels, while all the remaining symbols on the slot reel will re- spin. This, in turn, can lead to multiple wins for a player. This feature is triggered at random, if the Re- Spin overlay appears on a symbol during the time a winning combination is at play. The Re- Spin that was triggered will play at the same coin value and bet level as the spin that caused it. There is also the possibility of both these features i.e. the ‘Nudge Feature’ and the ‘Random Re- Spins Feature’, being activated at once. In this case, the Re-Spin Feature will take a priority. A player will have only one re- spin at a given time. The respin can be depicted by any symbol present on the reel during a winning game round. The re-spins feature can be re- triggered so long as one or more than 1 re- spin overlays on the slot screen, after the previous re- spin has been played. With an ancient Aztec or Mayan temple hidden deep in the heart of the jungle, this online slot game by NetEnt is highly adventurous. On entering the ‘Temple of Nudges Slot’, a player has to become allies with dangerous wild creatures like Cougars and Anteaters and Sloths too. The Sun, the Birds and the Snakes are another surprise that are decently helpful in the adventure, if not equal, in comparison to the wild animals. There is no free spins feature or even a Scatter or a Wild Symbol in the game, however, there is a ‘Re- Spins Feature’ that, when combined with the other main feature of the slot game called the ‘Nudge Feature’, results in multiple winning combinations and larger pay outs. Even though most wins in this slot are not as big and the winning symbols seems to be highly stacked, the constant (or multiple) coin wins is a good alternative. So, enter the jungle with this NetEnt powered slot game and learn about the treasures that might be hidden in the depths of the historical temple. Play for real money on any of the online casinos given in the list and help yourself to some thrilling adventure in this ‘Temple of Nudges Video Slot Game’. 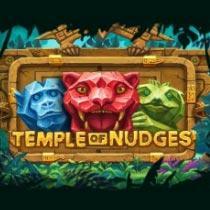 Please enter your review for the Temple of Nudges Slot .